WASHINGTON - Hold the mystery meat: Military bases will soon be serving more fruits, vegetables and low-fat dishes under the first program in 20 years to improve nutrition standards across the armed services. First lady Michelle Obama and Pentagon officials planned to announce the effort Thursday during a visit to Little Rock Air Force Base in Arkansas, where the military has been experimenting with the idea through a pilot program designed to improve the quality and variety of foods served on base. It's not just about giving members of the armed services a more svelte profile. "The Department of Defense considers obesity not only a national problem, but a national security issue," said Dr. Jonathan Woodson, assistant secretary of defense for health affairs. "About a quarter of entry-level candidates are too overweight to actually either enter the military or sustain themselves through the first enlistment." The Pentagon spends an estimated $4.5 billion a year on food services, and $1.1 billion a year on medical care related to excess weight and obesity. Under the Military Health SysSOMETHING HEREtem's new obesity and nutrition awareness campaign, more fruits, vegetables, whole grains and lower-fat entrDees will be coming to the 1,100 service member dining halls in coming months. Healthier choices will be turning up in base schools, vending machines and snack bars, too. Mrs. Obama, who has been leading a campaign against childhood obesity, said the military effort would send a message to the whole nation. "When our service members make healthy eating a priority in their lives, the rest of us are more likely to make it a priority in our lives," she said in a written statement. "Simply put, this is America's entire military once again stepping forward to lead by example." The first lady was visiting Little Rock as part of a three-day national tour marking the second anniversary of her "Let's Move" campaign. 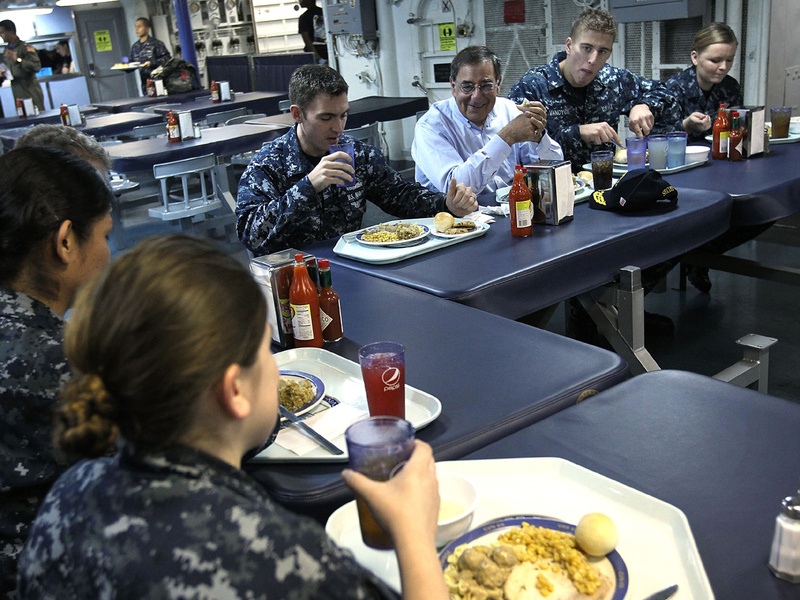 Under the new program, each of the armed services will be asked to update menu standards for the first time in two decades and to ensure that healthier food choices are available. "We are intent on focusing on preventable illnesses to help our people stay out of our clinics and hospitals by improving their physical condition," Woodson said in a statement. He said surveys in the mid-1990s found that about 1 out of 50 members of the armed services had weight problems. By about 2005, the figure was 1 in 20 service members.